EXPERT DRY Marking Pencil This pen with a black graphite lead lets you write on virtually any surface. Simply press to propel the lead into view or to retract it into its protective housing. The 2.8 mm thick and 125 mm long lead produces lines from thick to thin. 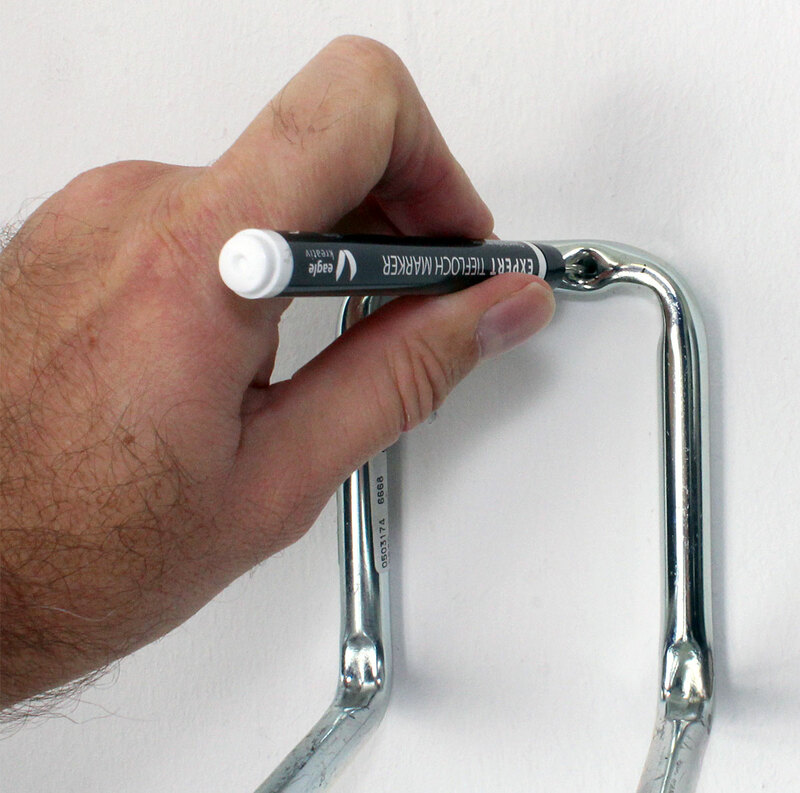 Use the sharpener integrated in the clip to get the line thickness you want. On smooth surfaces the lines can be removed with a damp cloth. For safekeeping there is a holder with a belt clip for the EXPERT DRY pen; it won’t drop out when you bend over, because it is gripped securely at four locking points. EXPERT DRY Refill Lead Set Basic The EXPERT DRY Basic lead refill set contains 4 black graphite leads and 3 each red and yellow wax leads. 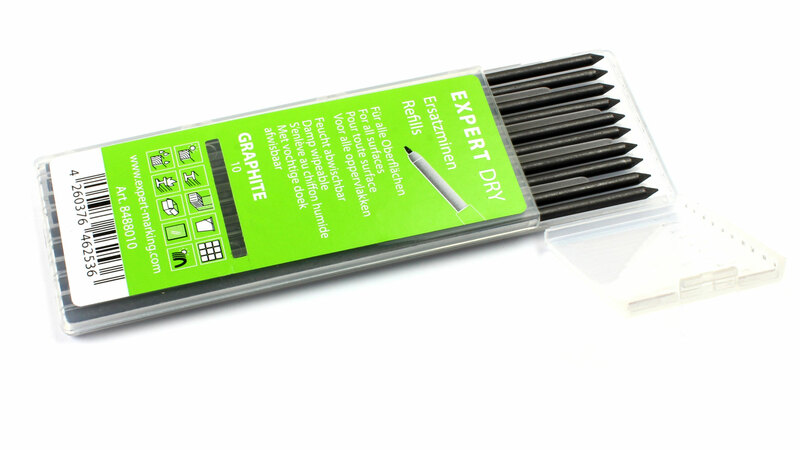 EXPERT DRY Refill Lead Set Graphite The EXPERT DRY Basic lead refill set contains 10 black graphite leads. Sharpener for carpenter pencils and wax crayons These large pencil sharpeners are ideal for carpenter pencils up to 16 mm in diameter. Note: We receive these pencil sharpeners in random mixes of yellow, blue and red. We try to allow for colour preferences, but may not be able to do so depending on the current stock situation. Pencil with fine, dropdown lead 0.5 mm for INCRA rules comes from INCRA, under the end cap hidden eraser. Propelling Pencil Promecha by OHTO This elegant propelling pencil is ideal for drawing and writing. To access the eraser lift off the lead-propelling barrel. Remove the eraser to reach a depot with 2 refill leads. Fit with commercially available 0.5 mm pencil leads. Aluminium body. 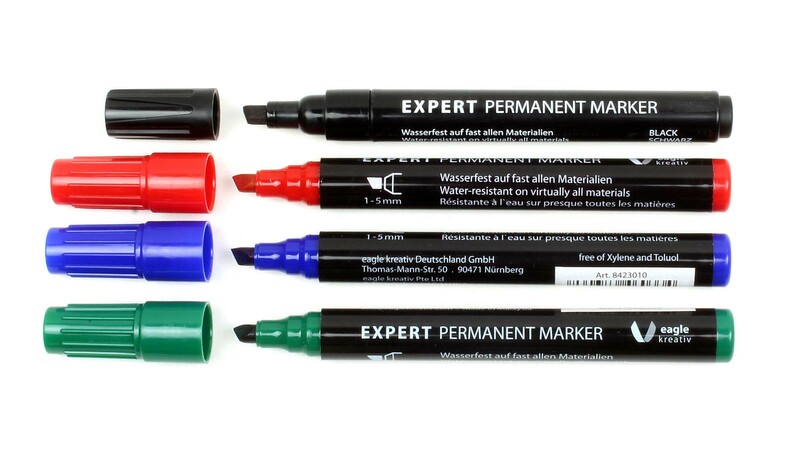 EXPERT permanent marker Waterproof! 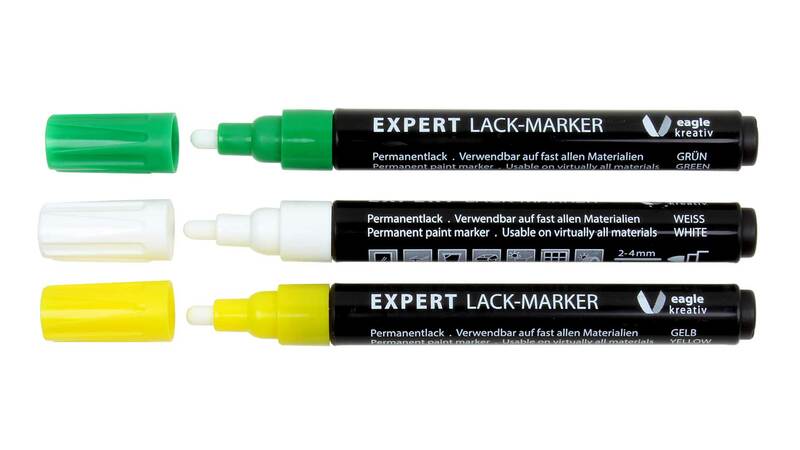 Ideal for marking on smooth and rough surfaces. Fast-drying and highly flame-resistant. Free from xylol and toluol. Tip round, line 1.5 to 3 mm thick depending on how the pen is held. Tip wedge-shaped, line 1 to 5 mm thick depending on how the pen is held. Mark your valuable possessions with your initials or an identification of your own design! 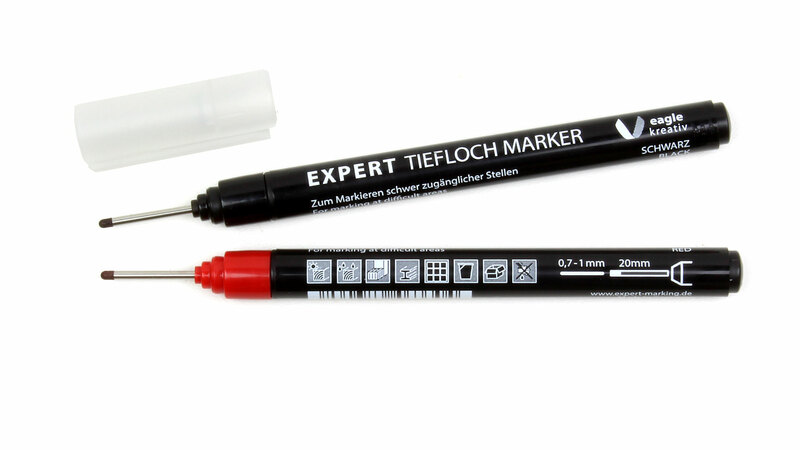 Simply brilliant for applying a permanent mark to tools and many other objects. The paint is waterproof, fast drying and sticks to virtually any material. Does not contain xylene and toluene. 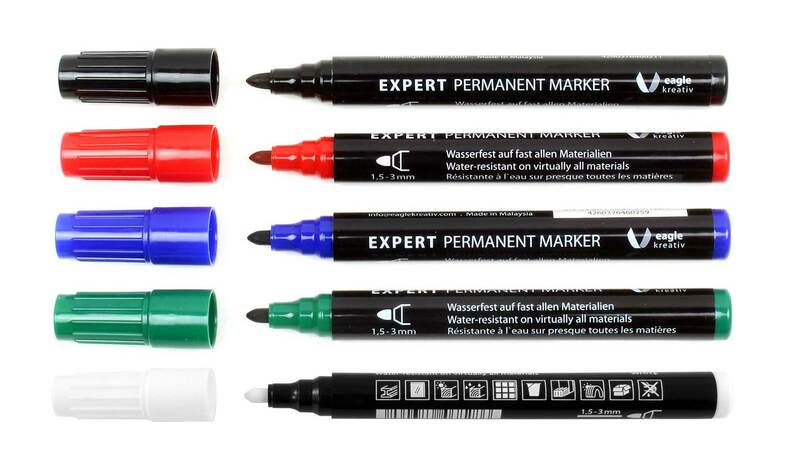 EXPERT deep hole marker For marking hard to access places that cannot be reached with a normally sharpened pencil. Tip diameter 2 mm, line 0.7 to 1 mm thick depending on how the pen is held.